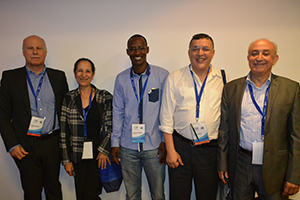 Left to right: W. Grisold, K. Al Zemmouri, M. Albakaye, C. Hicham, and El Alaoui M at the Maghrebian Congress of Neurology in Agadir, Morocco, November 2014. I was delighted to be selected for the first WFN training program at Rabat Center. The program is for 10 months of clinical neurophysiology training, from September 2014 to June 2015, in the Department of Neurology at the Mohammed V University, Rabat, Morocco. Before starting my training, I was given a precise program regarding my training in electromyography and electroencephalography. In September, I began my training in electromyography full time. I examine patients admitted for EMG and then review the EMG examination under the supervision of a teacher. I also attend the multidisciplinary consultation on myopathies with Prof. Nazha Birouk, who has taught me diagnostic approaches and treatment guidelines for these diseases. 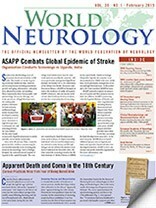 I also participate in various weekly meetings organized in the Hà´spital des Spécialités: the neurophysiological conference, where cases involving neuromuscular disease or epilepsy are discussed, and the conference on general neurology, where I presented my first case—epilepsy associated with cerebral cavernoma. In December, with the support of the Moroccan Society of Neurology, I had the opportunity to participate to the Maghrebian Congress of Neurology in Agadir, where for three days I attended high-level scientific conferences and teaching courses. I thank Prof. Mustapha El Alaoui Faris, Prof. Rida Ouazzani, and all the neurophysiological team for the welcome and mentoring that they have provided for me. I also thank the WFN for supporting my training. I hope that many African neurologists will have the opportunity to enjoy this high-quality scientific training in Rabat. Dr. Albakaye is a resident in the final year of training in neurology at the University Hospital Mohammed VI, Marrakech, Morocco. He is the first awardee of WFN for neurophysiology training at Rabat Center.